HomeNewsThe New Metasonic Watch by Gerald Genta that Plays Music! Oct 27 The New Metasonic Watch by Gerald Genta that Plays Music! Charles Gérald Genta was born in 1931 in Geneva, Switzerland and is quite a hip guy. Even the Gerald Genta website is snazzy; more like watching a movie than about viewing the watches. With words like “provocative, non conformist, and daring” flashing across the screen, that’s exactly what you get with a Gerald Genta watch. 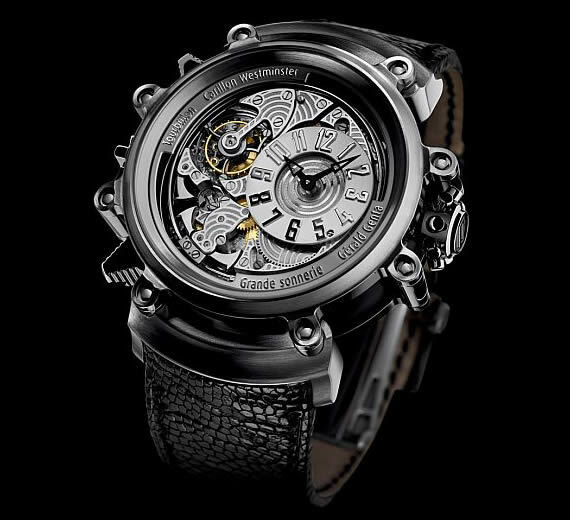 Perhaps most known for the Grande Sonnerie watch which was produced in 1994 and at that time considered to be the world’s most complicated wristwatch and valued at $1 million dollars, Genta keeps on impressing. Another one of his creations which debuted in 1994 was the Arena Grande Sonnerie collection. This exclusive series of watches was dubbed the Arena Metasonic and since ’94 has undergone multiple revisions and updates that keep making it cooler and cooler, hence the newly released one pictured here. This large watch, it comes with a 46mm case made from titanium and a special metal acoustic alloy, obviously tells time but it also plays music! Featuring a combination of vertical-polished and horizontal satin-brushed surfaces and an ostrich leather strap, the Arena Metasonic watch brings in the true magic of cutting-edge innovation to your wrist. 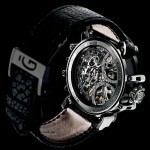 This new Arena Metasonic offers a selection of audio themed complications in two separate areas. First is the minute repeater function, which, on command, will play back the time using the sounds of gongs and hammers, and you can adjust the style / volume, so to speak. The second way is through the watch case which has been crafted to help each note sound loud and clear. This “music” made by these sonnerie watches is due to the extremely complex cases and the metals used to construct them with have reverberating qualities. These sounds occur at every hour or quarter hour but if you like you may silence them (there is a feature for that). This is one of the few water resistant sonnerie watches, which is quite a feat given all the levers and pushers on the case. The case itself is done in the signature “Potter finish” invented by Gerald Genta. The manually wound movement is visible through the two sapphire crystals and contains almost 1,000 pieces. The movement also has a tourbillon complication visible on the dial while the time itself is shown in an off-centered position.